Take Hwy. 7 west 5 miles to County Road 19/Oak St. (Excelsior Elementary School is on the right) and go right. Go to next right, which is Water Street. Go straight to 3rd St. Free parking is on either right or left of Water Street between 2nd and 3rd streets. Look for the Blue and Green Parking Signs as you drive down Water Street. Our boarding dock at the Port of Excelsior is just a short walk, with metered street parking also available in front of the port. Take 394 West to 494 South. Go Approximately 3 miles to Hwy. 7 west and follow directions above. Take 494 West/North to Hwy. 7 West and follow directions above. Ample FREE parking is available behind the shops between 2nd and 3rd Streets off of Water Street in beautiful downtown Excelsior and just a short walk to our dock. Look for the Blue and Green Parking Signs as you drive down Water Street. NOTICE REGARDING TUESDAY NIGHTS: The City of Excelsior Farmers Market operates May through October. This event will close down Water Street between 2nd and 3rd Avenues between the hours of 2-6 PM. Access through town is quite simple if you follow the detour signs, and the parking lots are still available from either 2nd or 3rd Avenues to either parking lot located behind the shops. Please allow enough time and arrive early and enjoy the Farmers Market yourself! The gateway to Lake Minnetonka! 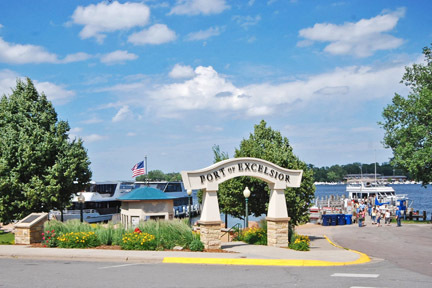 Many visitors arrive by bus and motor coach, and often they are dropped off for charter boat cruises at the Port of Excelsior, at the base of Water Street. Parking for buses and motor coaches as well as everyone else, presents some challenges. Please use the directions below for ALL CHARTER/BUS Parking. The following locations are the only locations that are designated for bus and motor coach parking. Buses are no longer allowed to park in the City’s municipal parking lots and/or on City streets, except where expressly allowed. Bus loading areas at the Port of Excelsior are designed and signed at the intersection of Lake and Water Streets. Parking is limited to 20 minutes. Beehrle Avenue. This is a wide, two-way street with little local traffic. There is a wide Y-intersection with County Road 19 which will facilitate turns from County Road 19. Excelsior Elementary School. 443 Oak Street (east side of County Road 19, just north of Highway 7). Bus parking areas have been established in parts of the school’s parking lot. The school site is available in the evenings after 6:00 pm., and at other times when school is not in session or special events are not scheduled. Bus engines must be turned off at all times while parked, and at all times while loading and unloading. Under no circumstances shall the motor be left on. This is the only notice you will receive, so it is imperative that you share this notice with each of your drivers. Any excuse from a driver claiming that they did not have knowledge of our parking regulations will not be an acceptable excuse. The driver will be ticketed.